A few weeks ago, we hosted a little celebratory gathering for our graduating senior. Usually when I host a get-together, I get totally carried away making all kinds of party food, but life has been throwing us a few curves lately, and so I decided to keep things simple this time. 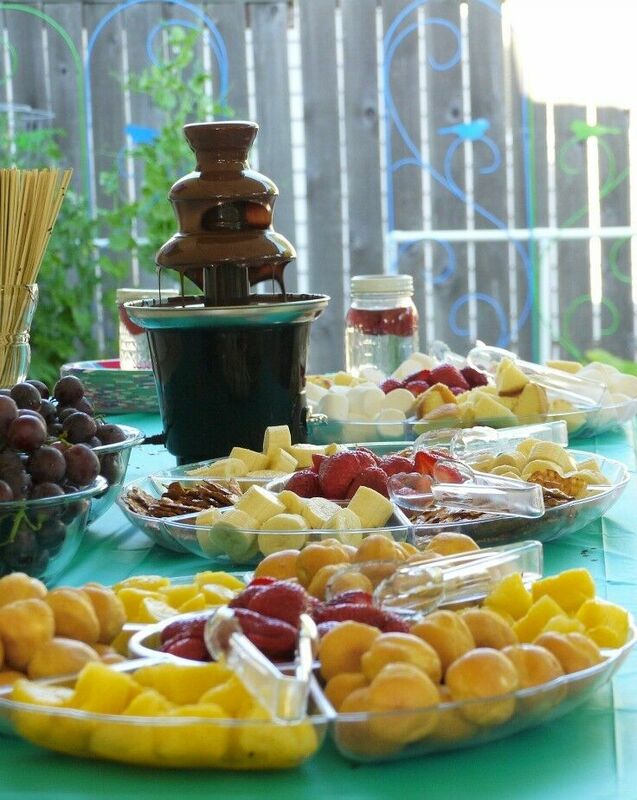 And what could be simpler than a chocolate fountain, right? When you are hosting a party and plan to use a chocolate fountain, the wind is not your friend. Even when you think it is only a little wind, and no one will notice. Because guess what? You’re wrong! The chocolate will notice. And so will the laws of physics. Besides the actual chocolate itself, location is the single most important factor in the success or failure of your chocolate fountain. Consider heating and air conditioning ducts, traffic flow, pet access, wind, rain, bugs and small children when choosing where to set up your fountain. Also, be careful about where you lay the electrical cord: if someone were to trip on it, it could have dire consequences for your entire party. Once we moved everything inside, everything flowed like Willy Wonka’s Chocolate River. 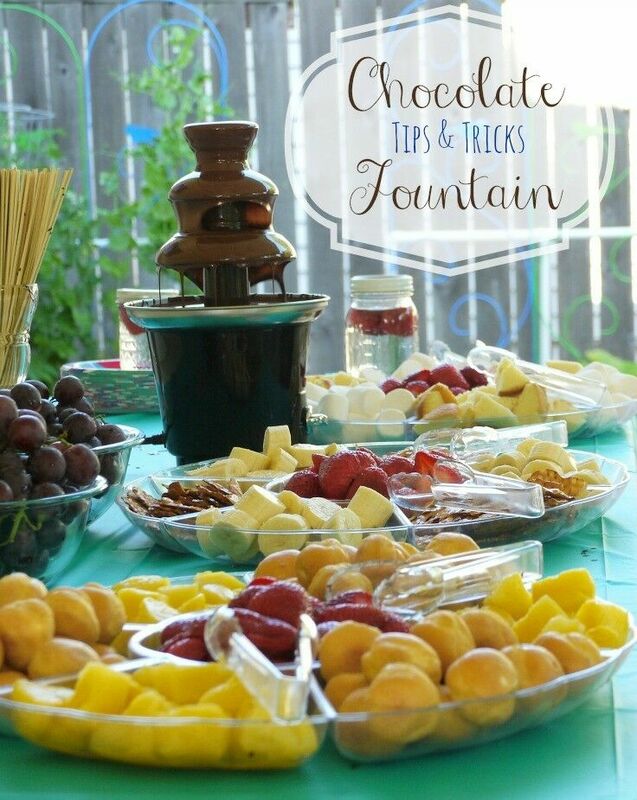 Before you ever pour a drop of chocolate into your fountain, make sure it is level. As in, plumb bubble-up level. Once again, melted chocolate is all about the laws of physics. Although I was tempted to buy more expensive chocolate, I decided to go with good old Tollhouse Semi-sweet Morsels, for a couple of reasons: they are low in milk solids, they are available at Costco in huge bags for a decent price, and they taste delicious when you melt them. In order to get the chocolate to flow properly, you need to mix it with oil. (I know – you just squinched up your nose and said Eww.) But I stumbled onto the perfect solution: unrefined coconut oil. A ratio of one tablespoon of coconut oil per cup of semi-sweet morsels works perfectly and tastes delicious. 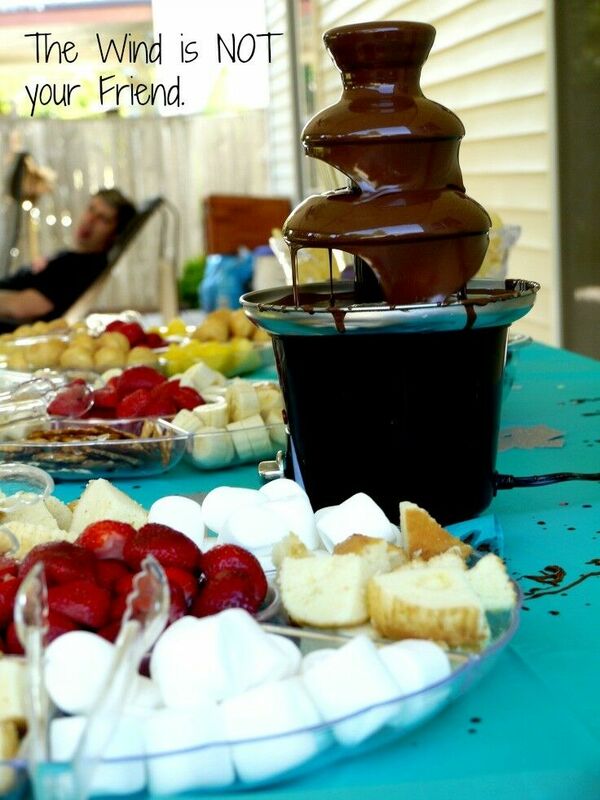 Preheat your fountain before adding the chocolate. When you have the fountain filled and running, let it run for a minute or two and then turn it off. Wait a minute or two and then turn it back on. This will help get any air bubbles out of the tube and auger system. Also, be sure to take the time to set up a second batch of chocolate for when you need to refill the fountain later. We had lots of delicious choices for dipping: Bananas, Pretzels, Pineapple, Cream Puffs, Marshmallows, Pound Cake, and lots of Strawberries. 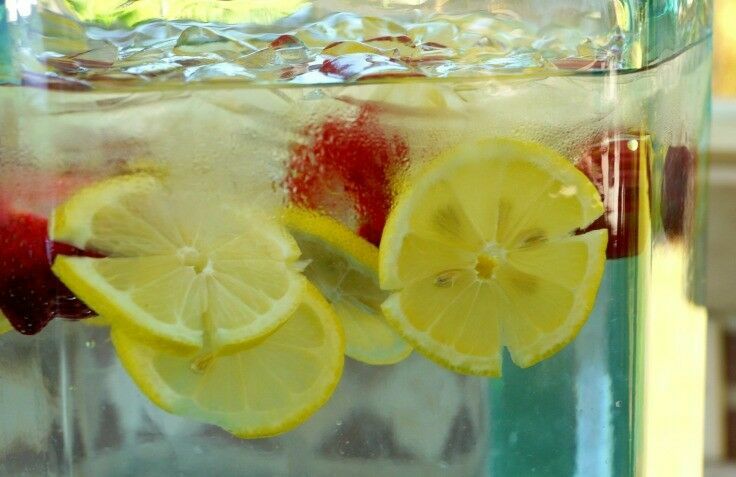 No matter how tired you are – clean the fountain right away. If you wait until the next day, the chocolate will harden up and it will take you ten times as long to clean. 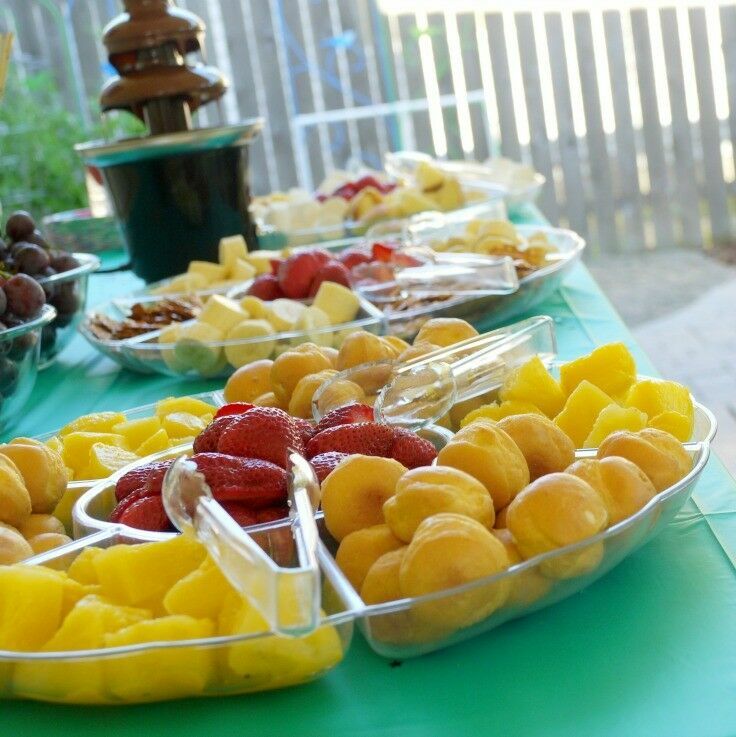 I hope you have great success with your party planning, and if you learn some new chocolate fountain tips, please be sure to come back and share them with us all in the comments! I like that you provided some tips! I’m sure despite those hardaches with the wind and such that the fountain was a big hit. I mean seriously, how fun!?! Great idea! I’ve always been a bit intimidated by chocolate fountains, although your tips make total sense. Knowing me, I probably would have put the fountain right in front of a fan! Great tips! I also use wood skewers or toothpicks for people to use instead of them getting their fingers directly in the chocolate. Much more sanitary expecially for kids that love to stick their whole hand in the chocolate! That’s a good thing to mention. i kind of took it for granted that everyone just knew to use fondue forks or skewers. No one wants everyone else’s fingers in their chocolate! Can you use refined coconut oil? Does it have to be unrefined coconut oil? I think refined coconut oil should work. I’ve never used it for this purpose because I kind of like the subtle coconut flavor the unrefined oil imparts, but I can’t think of a reason why it wouldn’t work. If you use it, I’d love to hear back on how it goes. Thank you for this post. I’m about to use coconut oil for the first time and needed the ratio for Nestle semi sweet chips. Allow me to add two additional suggestions. You mentioned leveling the base, excellent, I suggest this additional step. After the base is level I install the tower (the auger isn’t necessary here), my fountain has 3 pins in the base that the tower sits on. With the base lever take the level and check the top of the tower and notice how far out of lever it is, lift the tower up and rotate it clockwise until the pins fit again and check the level again, do this as many times as necessary to check all positions – then go to the position closest to level and relevel the unit to plumb at the top of the tower so the chocolate flows evenly. Second suggestion – when your unit is heated and level, and the chocolate is melted and you are ready, – fill the base almost to the top. Turn on the auger and run it as was suggested and turn the auger off to drain down to remove bubbles, turn it back on. Here is the suggestion DO NOT TOP OFF THE CHOCOLATE IN THE BASE. It’s tempting, you have the extra melted chocolate right there, and there’s room in the base – but don’t do it. If for any reason that auger stops (there are lots of reasons, power interruption, something falls off the toothpick or fork anything that gets stuck in the auger causing it to stop etc.). When that auger stops all that extra melted chocolate cascades beautifully down the sides of the base, putting an even coating on the counter or table it’s set up on and often every nook and cranny in your flooring and grout. While it is beautiful and will once again will make the fountain them main topic of conversation, it’s not as much fun as you might think. Great suggestions and comments below. Ur sense of humor makes me want to just jump in and try it. Anyone know if the Nostalia brand is ok? It’s so inexpensive that it makes me wonder. The reviews were all over the place. The ad says it does NOT need oil. I’m guessing u would do it anyway? Thank you so much for the tip about coconut oil to add to the chocolate chips. I was struggling to justify spending so much on the expensive chocolate designed for fountains. But I saw your tips and it gave me confidence to try it! I started with the ratio you suggested and then added enough for the chocolate to flow through the tester funnel provided with the machine. It worked fabulously, and everyone loved it! Thank you so much! Thank you so much for checking back. 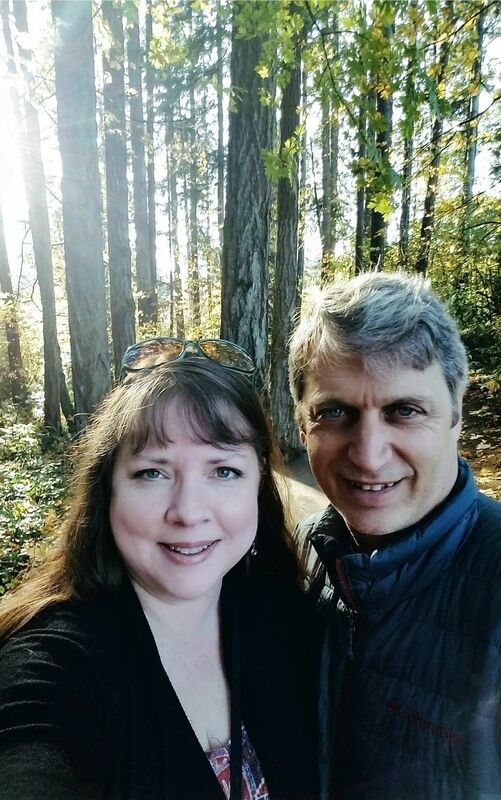 I’m so glad it worked so successfully for you, Andrea! I have fractionated coconut oil that I use with my essential oils. Will that work? This is outside my area of expertise, but as I understand it, the answer is “maybe, maybe not.” Personally, I would avoid using fractionated coconut oil at all, because not all fractionated CO is food grade; moreover, it is generally formulated to be used topically as a carrier, and not ingested.